A two mile drive through Coney with over 1 million lights. Daily November 11- January 1st. $6 per person, with a portion of the proceeds benefiting the Salvation Army and the Ruth Lyons Children`s Fund. This is fantastic and I cannot wait. CINCINNATI, OH – A new family holiday tradition begins this winter at Coney Island. The historic amusement park announced today they will be hosting CHRISTMAS NIGHTS OF LIGHTS a dazzling seven-week display running November 11th through January 1, 2017. This family event features a 2-mile car ride through Christmas displays and light shows consisting of over a million LED lights, driven by more than ten thousand computer channels. Visitors of all ages will be awed by the larger than life trees, glowing snowflakes, dancing candy canes and fantastic tunnels of lights! In the warmth of your own car, you can sing along to the sounds of the season synchronized to each holiday display. The show will begin nightly at dusk and run through 10 p.m. Christmas Nights of Lights will be open every night including holidays. The Salvation Army and the Ruth Lyons Children’s Fund will benefit from the new family holiday event, Schutter added. Admission for the new Christmas Nights of Lights experience is just $6 per person, with children three and under free. All tickets sales are day of, upon arrival. The holiday light show is produced by Titan Light Shows, Inc., Bristol, Tennessee. 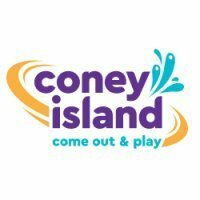 For more information, visit the park’s website at www.coneyislandpark.com. I love Christmas lights displays, but I'm not big on the drive through ones. Once you drive through you're done. I much prefer lights displays that let you walk around at your leisure. You can walk around and take as much time as you want. My friends and I went to a drive through lights display several years ago at Pyramid Hill in Hamilton. We paid around the same price ($5-6 a person) and drove through the display. 10-15 minutes later we were done and no option for re-entry of course. It just doesn't feel like you're getting your money's worth. I can hope that one day we will get a coaster or a log flume ride. Both would be big hits at Coney. More details have been posted (see link in first post above). The event will run from dusk to 10pm every day from November 11th through January 1st. A portion of the proceeds will benefit charity (the Salvation Army and the Ruth Lyons Children's Fund). The one thing that baffles me though is the pricing structure: $6 per person, with children 3 and under getting in free. Per person. For a drive-through display. I commented on the post on their FB page asking why it's per person for a drive-through display, and several others have complained about the price as well. Hopefully they'll change their mind prior to the opening, or this could end up being the only year due to "lack of interest" (since it's cheaper with 3+ people age 4 and over to just go to Sharon Woods where it's $13 per carload for normal vehicles). It should be noted that the Coney website says "a portion of proceeds" and not "all proceeds" will be donated as you mentioned, Oldiesmann. Looks like it should be a great display, but the price will turn a lot of people away unfortunately. Get three or more people over the age of 3 in a car and it's cheaper to go to Sharon Woods. I went through Sharon Woods once. I wasn`t that impressed. I do agree it seems a little odd that they are charging per person, and not by car. My wife and I are planning on checking it out. I will try and post some pictures after we go through it. Not sure when we will go through it though. Caught them testing their lights as i was driving home last night on 275.. definitely advertises for itself! Yeah, the one in Sharon Woods is underwhelming. This one looks very nice though. I would much rather do a walk threw than a drive threw though. I went down to Coney this evening and got to experience Christmas Nights of Lights. It was very impressive, and worth the $6 per person in my opinion. My wife loved it too. I would highly recommend checking it out. Here is a picture that my wife snapped. So I think I found the radio station for it, on our way across the bridge. Can anyone confirm if 92.9 is perhaps the station? That is NOT the station that they were using when I went through it. The signal for the station they were using is quite strong. I was still able to get it in my car when going down Kellogg (to the east) as far as Grove Park Grill. Oh that's actually pretty cool. We were stuck in traffic on the bridge (most of which was heading toward Coney) and I decided to fiddle around with the radio and see if I could find it. I found one playing Christmas music that seemed to match the movements of the lights fairly well, and that was 92.2. Do you remember what the station was, by chance? I visited the lights at the Mega Caverns last year. I agree that the display is good but if the only nights you can make it are Friday or Saturday I would skip it. The line of cars waiting is crazy. Do you remember about how long it took you to drive through it? About twenty five minutes through the actual display. We went on a Monday night and had no wait to get in. However, I have heard reports that the line to get in this past weekend was close to three hours long. It is worth the wait, but I would plan accordingly, and try and visit on a weeknight if at all possible. Drove by it the other night and from the highway it looked very cool and impressive. It is very impressive. Well worth the money to check it out. Hopefully Coney makes some money as well, and they can use it for new n improvements to the park.. I got the chance to check out the lights tonight with my wife and my parents and it is well worth checking out. I was amazed at how many cars were there on a weeknight. The traffic moved continuously so we didn't get stuck out on the highway. Great job all around though on the show and synchronization. I don't know what their profit margin was for the event but it was certainly spectacular to see from the freeway every night... and the lines went on for quite a distance. Hopefully KI saw what a million lights can provide on an entertainment level. I only wish it had been more of a walk through event. I would have gone just to wander the park for hours looking at the lights.